With the M551D-A2R, VIZIO has created an appealing 55-inch TV that delivers features, usability and performance at a competitive and tempting price. If you are a demanding videophile, this VIZIO's better-than-average picture quality may not meet your exacting standards. And if you are a died-in-the-wool geek, then you may be disappointed that you can't command this TV with your voice or the wave of your hand. But for the rest of us, the 55-inch M551D-A2R's bang for the buck is compelling. (Editor's Note: Currently VIZIO makes six sizes of their M-Series, starting with the 50-inch M501D-A2[R] [$799] all the way up to the gargantuan 80-inch M801D-A3 [$3799]. In between are the 55, 60, 65 and 70-inch models. Most of their specifications are similar, though as you can see, various models employ different zone patterns for their Smart Dimming algorithms. I have a few minor reservations about the consistency of the picture quality, but the VIZIO M551D-A2R's video performance should satisfy all but the most demanding viewers. The pair of 15W integrated speakers delivers respectable sound, but not the power nor the range that the 55-inch display deserves. VIZIO supplies what are now considered the essentials for a well-stocked Smart TV: built-in Wi-Fi, pages of apps, 3D capability, and ARC support. The TV does not include voice recognition nor motion control. The lack of voice and motion features make this VIZIO easier to use. And since this Smart TV isn't constantly trying to guess what you want to watch next, the interface is uncluttered and unobtrusive. A well-performing 55-inch Smart TV with all these features and an $1100 price tag is a real value. 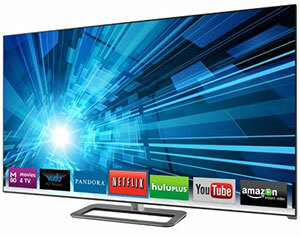 If in 2013, you find the VIZIO M551D-A2R for under $1000, you will have discovered a true bargain.